Tesla has announced four different solar roof tiles that the company plans to tie tightly into its manufacturing and sales of household and commercial battery systems, that will be able to store the energy while at the time making it available to charge Tesla electric cars. Tesla founder and CEO Elon Musk held a press conference Friday to announce the new rooftop solar tiles at Universal Studios Hollywood's old "Desperate Housewives" set, where the houses surrounding him all had recently had the new solar tiles installed on their roofs. "Electric cars originally didn't look good. They had low range; they didn't have good performance; they were like a golf cart. So people had a real hard time buying electric cars," Musk said. "Something similar has to happen to solar. We need to make solar panels as appealing as electric cars have become." A home with Tesla's Tuscan-style solar tile installed. The solar tiles will be produced by SolarCity at a Buffalo, N.Y. factory due to open in 2017. Tesla is currently in the process of acquiring SolarCity, of which Musk is the chairman. Tesla Energy, a subsidiary of Tesla, will sell the solar roofing products, along with home and business lithium-ion battery storage systems. "The goal is the have solar roofs that look better than a normal roof, generate electricity, last longer, have better insulation and actually have an installed cost that is less than a normal roof plus the cost of electricity," Musk said. Musk did not disclose what, if any, price premium the tiles would have over standard rooftop solar panels, which it will continue to sell with soon-to-be acquired solar rooftop installer SolarCity. Solar Panels will be targeted at homes with new or serviceable roofs, while the tiles will be targeted at new construction or replacement roofs. Telsa Energy's solar roofs will come in four types: Textured Glass Tile, Slate Glass Tile, Tuscan Glass Tile, and Smooth Glass Tile, and each is more durable than conventional roof tile, Musk said. 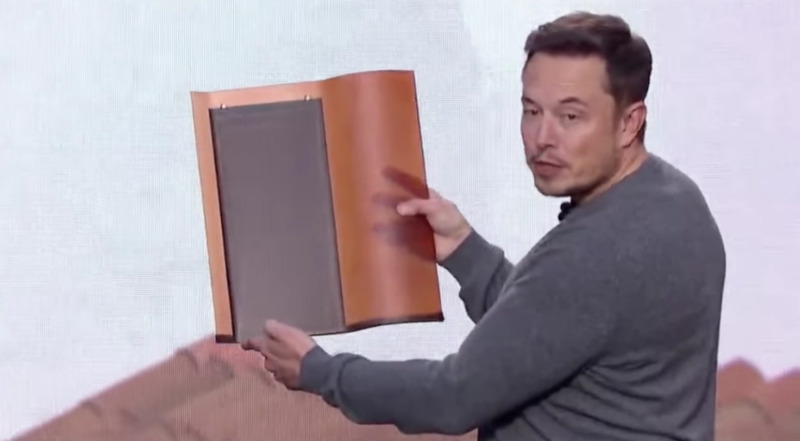 Tesla CEO Elon Musk holds up the Tuscan Glass Solar Tile, which looks opaque when viewed from the street, but when viewed straight on reveals the photovoltaic cells that generate electricity. Because they're made with glass, Musk said they can last "quasi-indefinitely," even in harsh northern regions, and that a 50-year lifespan can be expected. More importantly, Musk said the tiles have 98% of the efficiency of traditional rooftop solar panels, and they'll be able to produce nearly the same amount of energy per square foot. "There's about four to five million new roofs in the U.S. every year, and I think 20 times that number world wide," Musk said. "So you can imagine over time as people replace their roofs with solar roofs... everyone would have solar. Why wouldn't you?" Tesla Energy's new solar tiles tie tightly into the company's all-electric car business in two ways. The photovoltaic-produced electricity can be used to charge a vehicle, and it can also be stored in one of two battery systems Tesla is manufacturing at its Gigafactory in Reno, Nev. The company's goal with its new rooftop tiles is to spur adoption of clean, inexpensive electricity to create a "seamless and convenient charging experience wherever customers choose to travel." "Tesla owners can enjoy the convenience of plugging in anywhere to charge. Whether it's at home, in the office, or on a long distance road trip, Tesla has you covered," the company said in its marketing materials. Along with announcing its solar tiles, Tesla debuted an upgrade to its residential lithium-ion battery storage system, the Powerwall battery pack. Tesla said the new Powerwall 2 system has 14 kilowatt hours (kWh) of capacity with 5kW of continuous output and a 7kW peak output rating. "You need battery packs because the sun doesn't shine at night," Musk said. "You can take a four-bedroom house and power the fridge, sockets and lights for a day. And, If you have solar on your house, you can power it indefinitely. That's just with one [battery pack]." Earlier on Friday, Tesla Energy announced it had doubled the capacity of the second generation of its commercial lithium-ion battery system -- the Powerpack 2. This also doubled power capacity over the original Powerpack from 100kWh to 210kWh, with a 50kW continuous output. "We think it's great. We think this direction of offering more than just a solar panel on a roof is important for making the solar market go mainstream. Three of four homeowners if given choice prefer a system more tightly integrated," said Oliver Koehler, CEO and founder of three-year-old solar shingle maker SunTegra. SunTegra is one of two companies currently selling rooftop solar shingles and tiles; the other is CertainTeed. Koehler believes Tesla and SolarCity's entrance into the solar shingle market can only help with industry exposure, which has been limited at best. A home with Tesla's new Tuscan solar slate tile. Dow had manufactured the Powerhouse Solar Shingle, but after five years the product was discontinued earlier this year. Dow plans to license the intellectual property for its Powerhouse shingles to other manufacturers. Koehler believes Dow's solar shingles were not successful because they relied on thin-film technology, which is more expensive and less efficient than standard silicon crystalline solar cells. Traditionally, solar shingles have been more expensive than conventional solar panels, but they're becoming more cost-competitive. Installing solar shingles is more cost effective when replacing your roof, because they can be integrated into your conventional asphalt roof shingles, according to EnergySage, an online solar marketplace. Similar to Expedia or Kayak, EnergySage is a free online service that allows users to input their information and retrieve standardized quotes for a service -- in this case, the installation of a rooftop solar system. EnergySage generates revenue from fees paid by solar suppliers and is part of a nascent industry that includes other, smaller players such as Geostellar. In addition to slightly higher costs, solar shingles have been less efficient than traditional solar panels, so homeowners need to cover a larger surface area to get the same amount of electricity. "That being said, solar shingles can still generate savings on electric bills," EnergySage stated in a blog post. Solar shingle manufacturer CertainTeed said that its most popular offering -- the Apollo II -- has a solar conversion efficiency of about 14.7%. "Most major panels are higher, and more premium brands like LG, Panasonic and SunPower get up to around 18 to 22%," EnergySage stated. SunTegra's solar Tile is rated at 67 watts and measures about 1.5 ft. × 4 ft., and it also has an efficiency of up to 14.5%. Each of SunTegra's solar shingles produce up to 100 watts of electricity and are 4-ft x 2-ft in size. They're installed directly on a roof in an overlapping fashion over standard roofing. The company's solar tiles are marketed mainly in Colorado, Texas, Florida and the Southwest, and are 13.5 in. wide. Typically 25% of a roof must be covered to product enough energy to warrant a system installation, Koehler said. A roof with SunTegra's Solar Tile installed. SunTegra's solar shingles and tiles are based on the same technology as typical rooftop panels, which Koehler said allows his company's product to be more reliable and readily available through a robust supply chain. Because the SunTegra product is not as ubiquitous as solar panels it still costs from 10% to 20% more for a full rooftop system, Koehler said. "As we grow in scale, we can eventually have a similar system level price if you add in savings from not having to install a standard roof where the solar shingles or tiles would be," Koehler said.